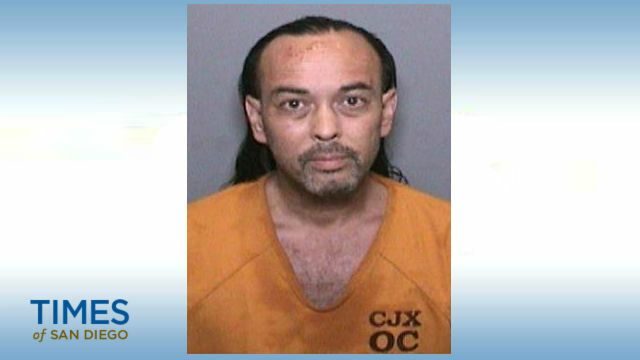 A 51-year-old man was behind bars Wednesday on suspicion of arson in connection with the fast-moving wildfire that has charred 4,129 acres and destroyed a dozen cabins in the Holy Jim Canyon area of the Cleveland National Forest and was advancing into Riverside County. Forrest Gordon Clark was arrested Tuesday and is being held in lieu of $1 million bail, according to jail records. U.S. Forest Service officials said Clark was booked on suspicion of two counts of felony arson, one felony count of threat to terrorize and a misdemeanor count of resisting arrest. The fire started Monday but was only 5 percent contained as of Wednesday morning, according to sheriff’s records and fire officials. The Orange County Register reported that Clark lives in a cabin in the Holy Jim area. Volunteer Fire Chief Mike Milligan, who also lives in the area, told the paper that Clark has long feuded with a neighbor and other cabin owners. He ran through the area last week screaming, and sent Milligan an email warning that “this place will burn,” Milligan said. Clark is tentatively expected to appear in court Thursday. On Tuesday, the size of the fire had been listed at 3,399 acres, but it increased in size near the Horsethief Canyon area, authorities said Wednesday. Now it has jumped the North Main Divide dirt road, so now it is in the Lake Elsinore area, Bommarito said. There will be continued aerial and ground firefighting efforts Wednesday, with 10 helicopters and seven fixed-wing aircraft assisting ground crews, who are building bulldozer lines, authorities said. About 385 firefighters were battling the blaze. With so many wildfires throughout the state, the firefighting personnel has been spread thin, Bommarito said. “Fire will continue to spread southeast and north with only limited spread to the west,” according to a Cleveland National Forest statement. “The lack of resources for direct attack will allow the fire to spread into new areas, and align for strong head-fire runs and potential for an `Elsinore’ downslope event. Weather conditions with temperatures exceeding 100 degrees and relative humidity below 15 percent will provide conditions conducive to extreme fire behavior as well as heat illnesses for the firefighters, the U.S. Forest Service said. Trabuco and Holy Jim canyons were under mandatory evacuation orders, as well as the Blue Jay and El Cariso campgrounds. All campgrounds in the Trabuco Ranger District were closed and forest road closures were in effect for Trabuco Creek, Maple Springs, North Main Divide, Bedford and Indian Truck Trail. Voluntary evacuation orders are in effect in the Sycamore Creek, Glen Eden Canyon, Rice Canyon, McVicker Canyon and Horsethief Canyon areas. 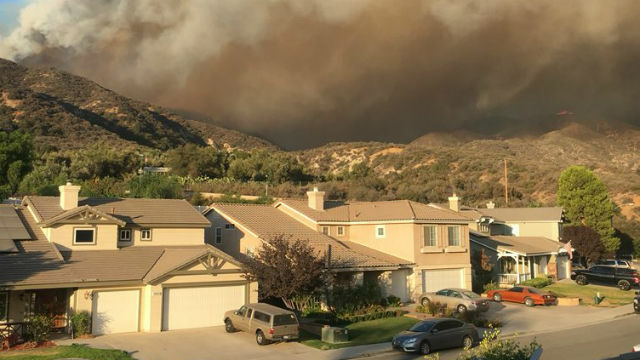 Lake Elsinore is not under evacuation warning, the U.S. Forest Service said. Voluntary evacuations were also ordered for the Ortega (74) Highway corridor west of the Lookout Restaurant to Nichols Road. A care and reception center was established at Temescal Canyon High School on El Toro Road in Lake Elsinore. Small Animals can be evacuated to Animal Friends of the Valley at 33751 Mission Trail in Wildomar. Information was available by calling (951) 674- 0618 between 8 a.m. and 4 p.m. or (951) 506-5069 between 4 p.m. and 8 a.m. The fire was burning downhill toward the Main Divide forest road at a “moderate rate of speed,” within sight of Corona, El Cerrito and Glen Ivy Hot Springs, according to the U.S. Forest Service. A U.S. Forest Service spokesman said more than a dozen cabins in Clark’s neighborhood had burned. Clark’s cabine, however, was not damaged by the fire, the Orange County Register reported. Residents should expect to see “more smoke in the area” as the flames produce “vertical plumes,” but the flames aren’t as close as it would look to residences in the Lake Elsinore area, said Steve Rasmussen, a spokesman for the unified fire management team led by the Cleveland National Forest and the Riverside branch of Cal Fire. Humidity has improved Wednesday, but it is still a factor. The steep terrain makes it difficult for fire engines to get to some of the flames, so the major weapon against the blaze are air drops, Rasmussen said. The phone numbers for residents to call for information on the Holy Fire have changed, according to CalFire. The new numbers are (714) 573-6200 and (714)-573-6202.